David's figure holds out the world-famous bible for all to see, and is more dynamic but perhaps less dignified than Thorvaldsen's. The same may be said of the design for the plinth. 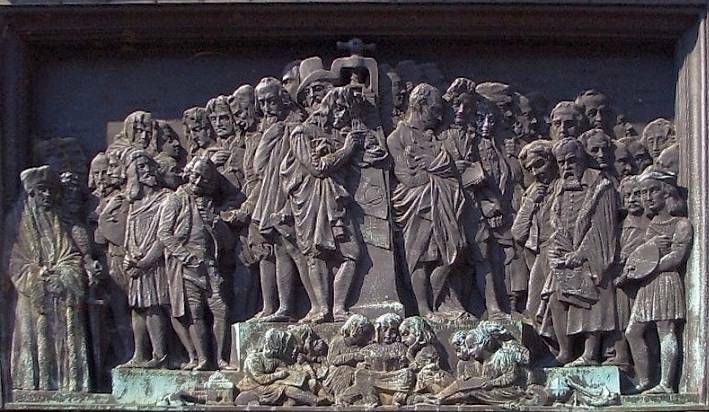 Instead of Thorvaldsen's restrained stone carving, David's plinth features four crowded panels of bronze reliefs, telling the story of the printing press's influence on every corner of the globe. Thorvaldsen's statue was installed in 1837, so the almost contemporaneous work of the two sculptors makes a fascinating contrast, demonstrating the swing away from neo-classicism, and perhaps also its dangers. David, who had carried out major commissions like the sculpture for the pediment of the Pantheon in Paris, was undoubtedly "the busiest and most popular of French sculptors of his day." Yet he was also criticised, and his later works were dismissed in the early twentieth century as "hurried, exaggerated and lacking in the calm and dignity which should characterize works of art" (Eaton 187, 191). However, this remark needs to be seen in the context of its times. 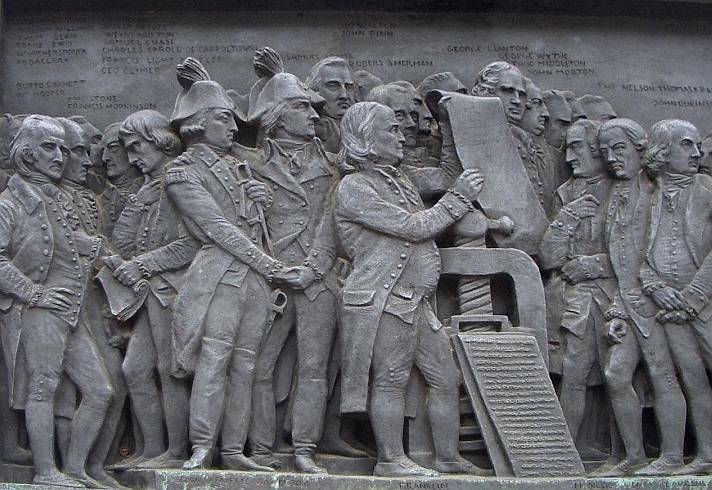 Left: Detail of America, showing Benjamin Franklin and other signatories to the Declaration of Independence, including George Clinton, Francis Hopkinson, Charles Carroll, George Wythe, John Morton, Samuel Chase and Thomas Nelson. Other famous liberators like General Lafayette and Simon Bolivar are present too. 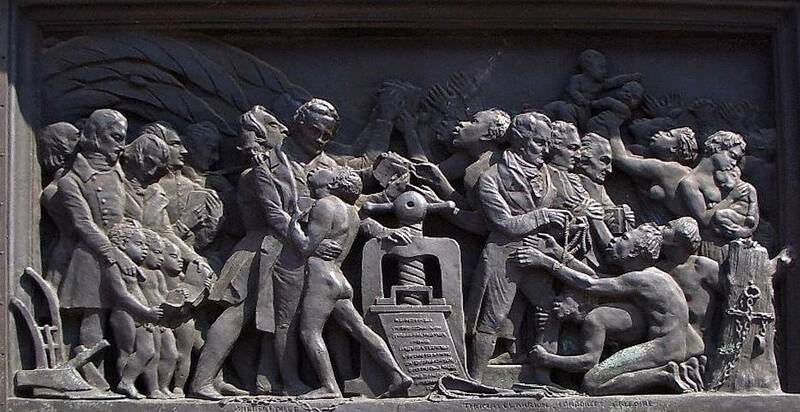 Right: Africa, showing Wilberforce and other abolitionists bringing freedom and enlightenment to the slaves. 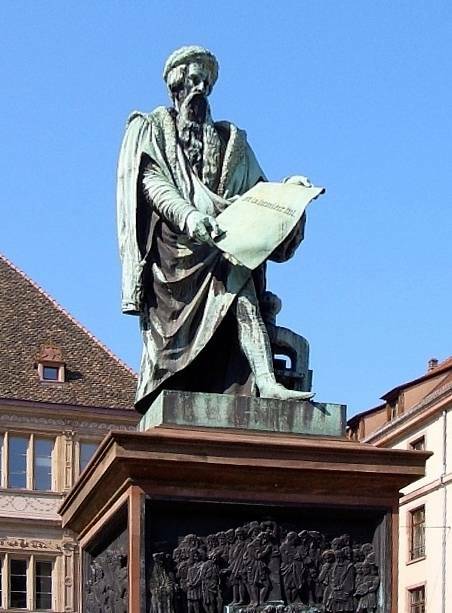 The printing press in Europe, showing such renowned men of letters as Erasmus, Chaucer, Milton, Molière, Rousseau, Voltaire, Kant and Schiller; the original plaster panel, which gave prominence to Martin Luther, caused an uproar (see Braun). N.B. The Asian panel is more weathered, but includes Brahmans exchanging manuscripts for books, and Chinese people reading Confucius. Braun, Suzanne. Le Monument de Gutenburg (Informative French site). Web. 17 November 2010. Eaton, D. Cady. A Handbook of Modern French Sculpture. New York: Dodd, Mead, 1918. (E-text).